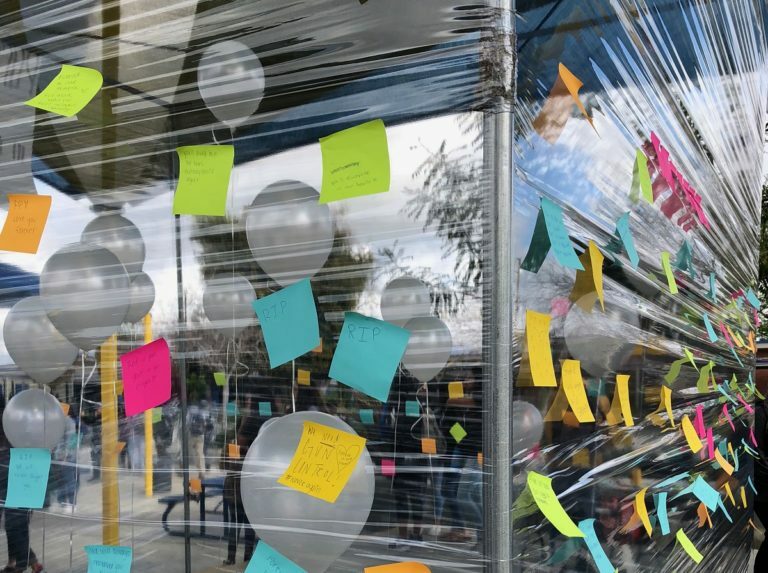 March 17, one month following the most prominent mass shootings to happen in 2018, Charter Oak High School held a moment of remembrance during a 17-minute break. In the event, Associated Student Body created a monument of remembrance: a large transparent centerpiece, with 17 white balloons inside. In front were pictures and descriptions of students and staff members who lost their lives in the Parkland shooting, a memorial created by senior Sela Pastrana. ASB had desks set up, allowing students attending to write something on a post-it note and paste it to the centerpiece. Among the notes were condolences, sadness at the event and anger at the government’s inaction. When 17 minutes were up, school staff urged the students back to class, but a few were determined to stay and have their voices heard. Sela stood up on one of the desks and announced that she organized the event because none of those who died in Parkland should be forgotten and none of them deserved what they got. After that, each of the candles were put out simultaneously by the students that remained there. The two juniors concluded by compelling their fellow students to register to vote. Ramon provided the number 788-683; any phone can send the message “p2p” to begin their voter’s registration. Though the walkout did not happen exactly according to the school’s plans, it was overall an effective way for the students to share their voices and their condolences. After all, we are the next generation, and our voices will matter, have mattered and will matter, just like the survivors of Parkland. Now when will our lawmakers say ‘Enough is Enough’?